A word of caution for our readers to consider before installing Mac OS Mojave, which is expected to be released some time in September. 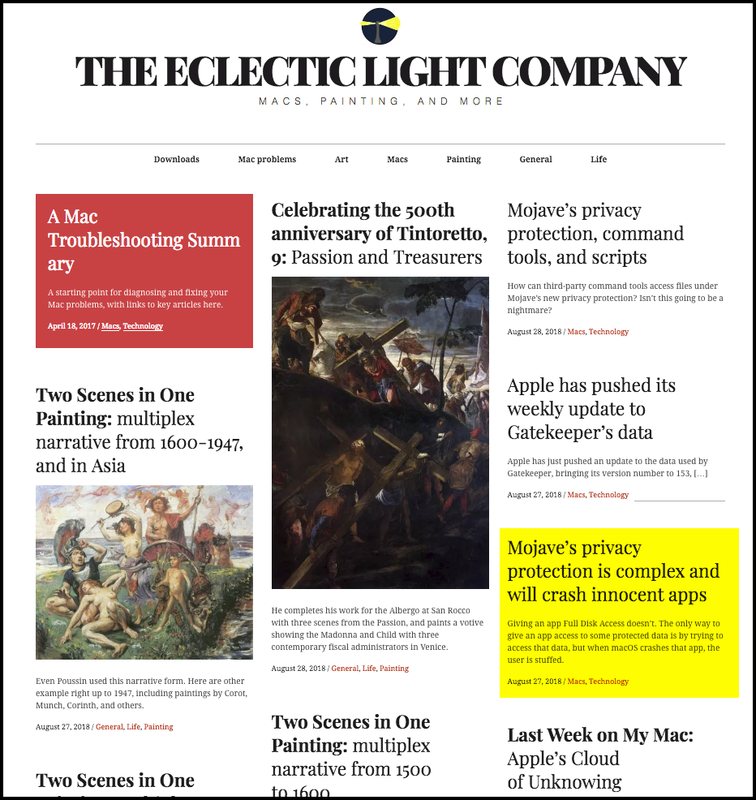 We follow a few tech bloggers who are Mac centric and one that we find particularly interesting is The Eclectic Light Company – Macs, Painting, and More, authored by Howard Oakley, one of the most interesting and prolific bloggers we subscribe to. Oakley is a very smart guy. He is a Mac OS app developer, but he’s much more than that and that’s what we love about him. So, to get to the point, this week Mr. Oakley wrote a blog post, Mojave’s privacy protection is complex and will crash innocent apps, and in it he states: “What I’ve learned is how complex its new privacy protection is, and how users, sysadmins and developers may be in for a shock when they upgrade to Mojave.” Users, that’s us. The take-away for us at Lightroom Guy is, that the current beta version of Mojave doesn’t run some third party applications. The result is an application crash without any indication of the cause.Oakley says, “Users will see this as a failing in the app, rather than the consequence of their action….” These issues will mostly stem from how Mojave’s new privacy protection works. And in the current Mojave beta version, so far there’s no simple way to know if an app will work. If this doesn’t change by the release date, expect that some of your apps may crash. To be clear, Mac OS Mojave is still being tested and not yet released to the general public, but it is expected shortly and these issues may still exist on release. Apple has also warned system administrators to prepare for Mojave, as there will be blowback for many users. MacWorld UK has a must read article – “Apps that won’t work with Mac OS Mojave.” – that includes how to check your current Mac OS to see if your apps are compatible. Oakley, as a Mac developer, has an inside perspective that we trust. So, again, we suggest you sit tight when Mojave is released and wait to see what happens. When the smoke clears, we’ll let you know. And, since you’ve read this far, here’s a side note on Howard Oakley. He’s also an art enthusiast and aficionado, writing weekly on a broad range of topics. From little known women artists, renaissance, post-impressionism and multiplex narratives, he’s an amazing resource of comparative art history. I’m barely touching the surface of his topics! Always a fascinating read. Howard Oakley, has written an app called 32-bitCheck. It’s free for downloading. The program identifies applications that conflict with the soon to be released Mac OS Mojave. 32-bitCheck comes with PDF instructions in the download. Again, hats off to Mr. Oakley for his contributions.